Both the vehicles were travelling at high speed when they crashed. The impact was so severe that the roof of the bus came off, causing serious injuries to the passengers. Two people were killed and 12 injured, two of them critically, in a head-on collision between a private bus and stone-laden tipper near Chka Gujjran village on the Jalandhar-Hoshiarpur road. The accident occurred at around 9 am and police said both vehicles were travelling at high speed when they collided. The victims have been identified as Purvi Juneja (in her early 20s), a law student at the regional centre of Punjab University in Hoshiarpur and a resident of Model Town, Jalandhar, and bus driver Satwant Singh (40) of Choganwan village in Moga district. While the girl died on the spot, the driver succumbed while on the way to hospital. Such was the severity of the accident, that the bus’ roof was blown away by the impact. According to eyewitnesses, the bus had tried to overtake another vehicle while the tipper was coming from the opposite side. The bus was on its way from Jalandhar to Hoshiarpur while the tipper was coming from the opposite side. Among the injured were Parminder Singh, Navneet Kaur, Joginder Singh, Balwinder Singh, Sat Parkash, Sarwan Das, Hidaye Ram, Ram Lal, Satwinder and Harpreet. All senior civil and police officials including Deputy commissioner (DC) Anandita Mitra rushed to the spot. She said that all the injured were admitted in the hospitals. According to initial reports, at least two of the injured are in a very critical condition and have been referred to Jalandhar and PGI in Chandigarh. The bus is owned by Congress leader and former minister Avtar Henry’s company Kartar Bus Service. 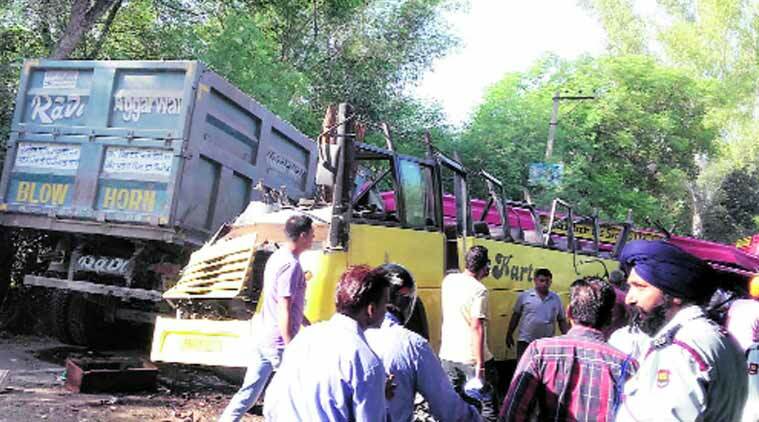 Company officials said the bus had left Jalandhar at around 8.15 am and met with an accident near Sonalika Tractors Complex near Hoshiarpur at around 9 am. Traffic was blocked on the stretch through the morning and was only restored in the afternoon after the bus was removed from the road. A woman in her car had a narrow escape as she managed to veer off the road to avoid being hit by the vehicles.